Mele Kalikimaka! ‘Ohana was tied for first place with Liberty Tree Tavern, so clearly DFB readers share my affinity for the islands! 🙂 After growing up in the snowy tundra of western New York State, Hawai’i sounds pretty good as a Christmas destination right about now! 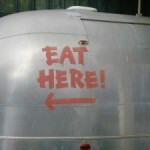 Plus, this location has a wonderful family-style service that makes it perfect for holiday family reunions. 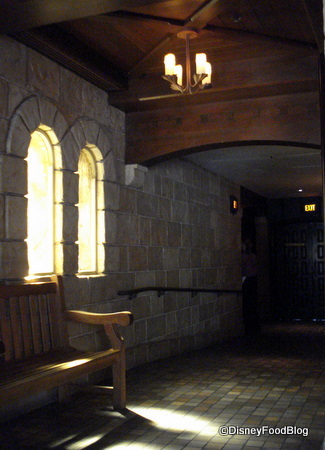 I’m pretty sure we never have a top list that Le Cellier Steakhouse doesn’t get voted onto! This cozy location is perfect for holiday dining, I must admit — the subdued lighting and feel of the wine cellar-like restaurant makes you feel like you must have just escaped the cold weather of a Canadian winter! “Dripping candle” sconces on the walls and pine decorations make this spot feel like you’re home for the holidays. This is the pick for a dramatic Christmas dinner! Sitting atop the Contemporary Resort with sweeping views of Seven Seas Lagoon, the Grand Floridian Resort, and the Magic Kingdom (including those all-important fireworks! ), California Grill will offer you a holiday dinner to remember! Located in Disney’s Wilderness Lodge, Artist Point‘s northwestern decor combined with the pine trees outside can easily make you feel as though you’ve gone north for the winter instead of south! 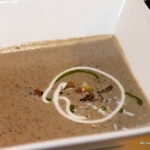 This cozy signature restaurant featuring soaring ceilings and beautiful murals serves up hearty, inventive dishes using signature ingredients from the northwest, including bison, rich cheeses, mussels, mushrooms, and venison. Of course, those were just the most popular choices! Other suggestions that got plenty of votes from our readers for their holiday dinners were Narcoossee’s, Citricos, and Victoria & Albert’s in Disney’s Grand Floridian Resort; Cinderella’s Royal Table and Crystal Palace in the Magic Kingdom; Jiko in Disney’s Animal Kingdom Lodge; Chef Mickey’s in Disney’s Contemporary Resort; and 50’s Prime Time Cafe in Disney’s Hollywood Studios. Also, remember that several Disney restaurants announce specialty Christmas Day menus closer to December. In 2009, these included: Biergarten, Boma, Cape May Cafe, Flying Fish Cafe, Chef Mickey’s, The Wave, Trail’s End Restaurant, 1900 Park Fare, Citricos, Narcoossee’s, Victoria & Albert’s, Grand Floridian Cafe, Olivia’s Cafe, bluezoo, Whispering Canyon Cafe, Captain’s Grill, Fulton’s, Wolfgang Puck Grand Cafe, Wolfgang Puck The Dining Room, and Portobello. 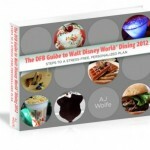 You can find information, details, Disney Food Blog posts, and links to current menus for all of these restaurants on our Disney World Table Service Restaurant Guide. The Candlelight Processional is a truly magical musical event that takes place in Epcot during the holiday season. You can learn all about it here, but for your planning purposes, just know that the Dinner Packages that accompany the event and offer priority seating at the Processional will be available for booking on August 26th. You’ve never seen Gingerbread Houses like these! Most of the Disney World deluxe resorts showcase massive Gingerbread displays ranging from live-sized cottages to huge carousels. It’s quite a site to see! Check out our 2009 Disney Gingerbread Display photos here. 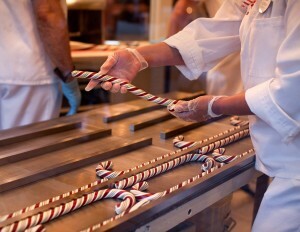 Disneyland’s Candy Canes are an institution! Guests line up around the Main Street “block” to see these limited edition sugary treats in the making. Candy-makers at the Candy Palace only make these for a limited time, and last year they had to begin selling tickets to purchase them! 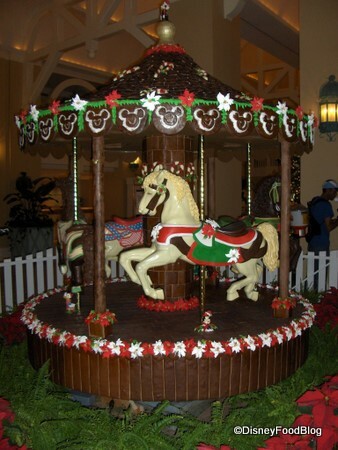 Throughout Disney’s parks you’ll find specialty items like holiday-flavored fudge (pumpkin and candy cane last year! ), rice krispie treats in holiday shapes, and specially wrapped chocolates and other delicious snacks. You can even purchase pre-made Gingerbread houses to bring home! My favorite addition, however, is the red and green Dole Whip! See Disney Christmas treat photos here, here, and here. This exciting event is one you’re never going to forget! Join Mickey, Minnie, and all their friends for a magical evening in the Magic Kingdom! Indulge in sugar cookies, ginger snaps, and hot chocolate to your heart’s content, then watch as Santa comes down Main Street in his massive sleigh while the snow (SNOW!) comes down all around you. This is a hard-ticket event, which means Disney only sells about 20,000 tickets per party. Find dates and prices for Mickey’s Very Merry Christmas Party, along with lots of other information about what Disney has planned for the 2010 holiday season, here. I’m so glad I’ve booked a short, quickie trip to Disney World for the 2010 WDW Today Podcast Reunion (a Disney fan meet up) this December! Writing this post has gotten me pretty excited! What are your plans for the holidays at Disney Parks this year? And, if you’re not going to Anaheim or Orlando this season, what would your ideal trip look like? I’d love to hear your thoughts and suggestions for our Disney Holiday blog post next year! This post is part of the 8th Edition of the DisMarks Blog Carnival! 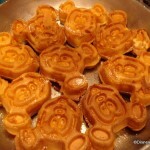 Be sure to check out the carnival to read more great posts about Disney! I’m just wondering what part of WNY you’re from? We live in Clarence Center and I’m surprised at how many “Disney Addicts” live around here! Great post. We love to go to DHS and see the Osborne Family Spectacle of Lights. It’s the perfect way to start off the holidays and you can buy some hot apple cider (or hot chocolate) in one of their souvenir holiday mugs and grab a gingerbread cookie as you stroll around viewing the light show. We did Biergarten one year for Thanksgiving. Think I’d still recommend it for Christmas. Had lots of items that we’d have at a holiday meal because of our heritage. So if your heritage is represented in the World Showcase, give it a try! Kelly — Biergarten was mentioned in the poll, but didn’t get enough votes to make the list. However, I agree with you — I think it would be a great place to celebrate the holiday! And they do have some Christmas tie-ins to the show! Hee hee! Just kidding, Liz! Thanks for the info! Even more excited about the spectacle now! Tucking this away for 2011, when we’ll be at WDW for my son’s 10th birthday (12/21) and Christmas. I CAN’T WAIT!!! Probably Artist Point. I love that place during the holidays. CanadiansloveWDW — We used to drive through Hamilton all the time back when I lived in that area! 🙂 Hopefully you’re coming to the WDW Foodie Fest on October 3rd!! chris — I’ve never seen it during the holidays; will have to get there soon! Thank you so much for taking the time to put this together AJ! I really do appreciate it. 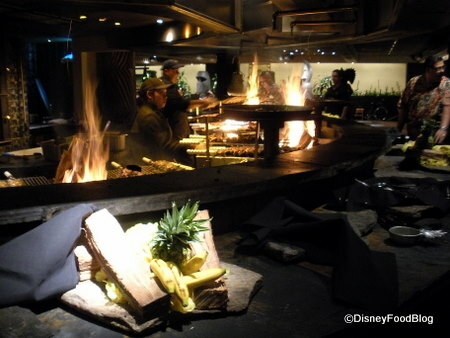 I’m glad that the California Grill in the Disney’s Contemporary Resort made the list. These are some really great pictures that you have I must say and the Mickey Mouse with the scarf is a nice touch. 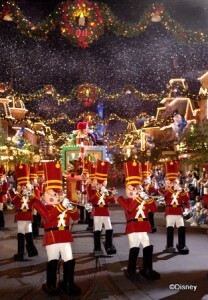 I never knew that about the Mickey’s Very Merry Christmas Party having a parade, this makes everything so much better. 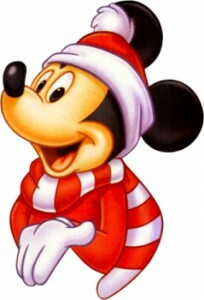 And what would Christmas be without Santa Clause (Santa Mickey?). I wonder how much in advance you need to book for it though since it’s a hard ticket event? Thanks, and keep up the wonderful work! Canadians Love WDW — Oh, have so much fun! Can’t wait to hear all about it!